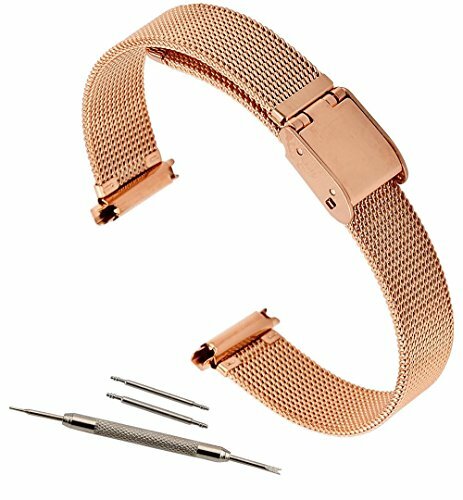 This is a new Smooth Mesh Bracelet Watch Band .The entire band is crafted from Ion Rose Gold Plated for superior wear and durability It is perfect for high-quality brand name watches such as Rolex, Curvex, Cartier, Piaget, Breitling and Bulova The formed and reinforced spring bar holdings give a perfect fit between the watch and strap The metal band measures 14mm in width and approximately 7 1/8" long The ends expand to fit watches up to 14mm in width Also included are two 14mm spring bars for easy attachment . If you have any questions about this product by United Watchbands, contact us by completing and submitting the form below. If you are looking for a specif part number, please include it with your message.